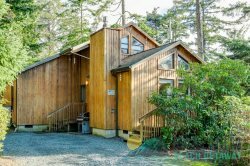 This wonderful Manzanita hideaway is just a block and a half from the beach and just a few blocks from the golf course on the south side of town. With a fully fenced yard and large wrap around deck, this is a wonderful set up if you are worried about little ones staying in the yard. The custom iron gate welcomes you to the private gardens. If light and bright is what you seek then this home is for you. The large windows, skylights and vaulted ceilings bring the outdoor beach setting inside for a remarkable Oregon coast experience. The kitchen opens to the living and dining room with a large bar that seats an additional five people. The bedroom on this floor is perfect for kids of any age with double bunk beds, TV and a puzzle table. The downstairs bathroom has a large, custom tile, walk-in shower and Japanese soaking tub with bath salts for a relaxing soak after a long day on the beach. The open staircase invites you up to the loft area where the wall of games, puzzles, books, Cd's and more are sure to keep your family busy and happy. There is a large bedroom at the end of the hall that has a queen bed, sitting area and a wet bar. Sliding glass doors open onto your own, private deck. The second bedroom upstairs is also spacious with a queen bed. Every room upstairs, including the loft, has skylights. The upstairs bathroom is beautiful with a large skylight located over the tub and shower. In the attached garage you will find bikes, toys, kites, three sets of golf clubs - two adult and one child - and sand buckets for the whole family. The fenced yard provides privacy and a great place to enjoy outdoor living with gardens, a large, wrap-around deck, outdoor shower,plenty of outdoor furniture and a fire-pit. Cable and WiFi are provided. Sea La Vie does not accept pets and does not allow smoking of any kind. We absolutely adored this home and all the various attentions to detail in the craftsmanship & entertainment. We took full advantage of the movies, games and fire pit for smores - a true kids haven. Falling asleep under skylights, watching the stars & waking up to the tree tops with various birds and wildlife flitting about, it was as almost like camping but warmer, comfier and by far cleaner! My only concern was the master bed was far from comfortable. The mattress is very thin and firm, much like a tumbling mat at the gym. I would caution anyone with back problems to bring additional supports or use some of the many blankets, as we did, fold them and lay them upon the bed for comfort. Dont let this detail deter you, the remainder of the experience makes up for this lacking - just be prepared. This is a wonderful place for a peaceful retreat! It's in a quiet neighborhood where you hear only the soughing of the sea. The walk to the beach is short and flat. Though surrounded by trees on three sides, the house is illuminated by many skylights and windows. There is an inviting mix of comfortable gathering spaces (the living and dining areas) and spaces for quiet contemplation (a loft area with many books and games, as well as two tubs for soaking after a day of beach-walking). The Japanese soaking tub is luxurious -- bring bath salts to heighten the experience. The large, fully equipped kitchen makes it easy to prepare meals for a group -- we chose not to eat out during our weekend women's retreat. All of us hope to stay at this lovely house again! This house is so cozy and homey and a wonderful place to stay in Manzanita! The location is great for access to the beach, though it is a bit longer walk to town on roads without sidewalks. The layout of the downstairs area is open and great for hanging out and cooking meals. The house also has a huge offering of fun games to play. The check in and check out process is very smooth as well. Thank you for a wonderful stay! Everyone was respectful and kind. Each person I talked to was prompt in getting back to me. The house was located just a block and a half from the beach. We enjoyed multiple beach walks each day into town. The I loved how comfortable the property was. There were books, board games, and a number of items you would find in your own home. home was comfortable and had more than enough space for us. We cooked many meals in the open kitchen and the gas fire was such a plus for our winter getaway. We can't wait to come back to Manzanita and stay in this wonderful home. Go here and stay and be happy. Great place for warmth and room and the kitchen will not let you down. We had a memorable Christmas here. The staff were very upbeat, supportive, and provided clear explanations to questions. Everyone enjoyed the house, expressed their appreciation, and said they would be willing to stay in the same house again. Internet problems in house #1. After Danielle worked with Charter to try to fix them, with no luck, she helped us move to an alternate house, which was great and likely better than the smaller house we had booked. The house was perfect for our little family getaway. Well taken care of, lovely, and cozy. There was a big bag of beach toys perfect for the kids. Great back deck that we had a few meals on. The house is close to the beach and in a wooded area, so peaceful. Close enough for a nice walk to town. Highly recommended. See above. Janet was great! The online photos of the property were spot- on, however the space itself was far cozier & accomidating than we had expected. This was a great space to share with adults & kids: functional, spacious & cozy all at the same time. [email protected] You are Fantastic! Love you and the staff you surround yourself with. Girl, you got it! Pot's and pans could use a little update. Teflon pan's were pretty scratched. But we fortunately brought our own. And no place to store our clothes, no dressers. But once again, a great experience. See you next summer, if not before. Thank you.